Download "CLINICAL NUTRITION (Curriculum Code GECNU002) 40 credits"
2 2 THE 40-CREDIT MASTER S PROGRAM IN NUTRITION AND DIETETICS WITH A CONCENTRATION IN CLINICAL NUTRITION (GEHONDMS:CNU002) INTRODUCTION The master s program in Nutrition and Dietetics with a concentration in Clinical Nutrition prepares students for a wide range of careers as dietitians in health care, community and private practice settings, as food industry specialists in public relations and media, and as nutrition educators in health care, community, or corporate health programs. The Master of Science program also provides the opportunity for students to meet the registration eligibility requirements of the Commission on Dietetic Registration (CDR): To view a video of an Information Session that covers the entire program, go to: Students who have already completed the Didactic Program in Nutrition and Dietetics (DPD) at an Accreditation Council for Education in Nutrition and Dietetics (ACEND) - accredited program and obtained a DPD Verification Statement may begin taking graduate level courses upon acceptance to this program. 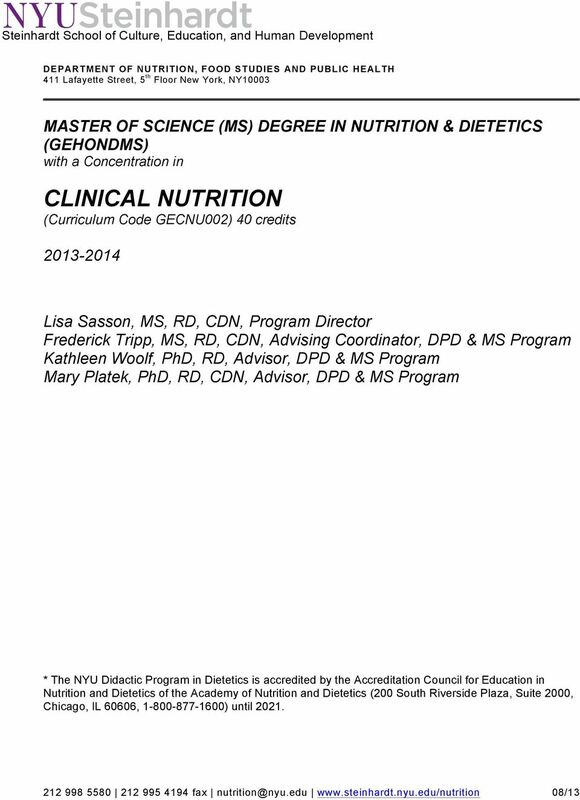 Please go to the CLINICAL NUTRITION (GEHONDMS:GECNU002) PROGRAM OVERVIEW section. 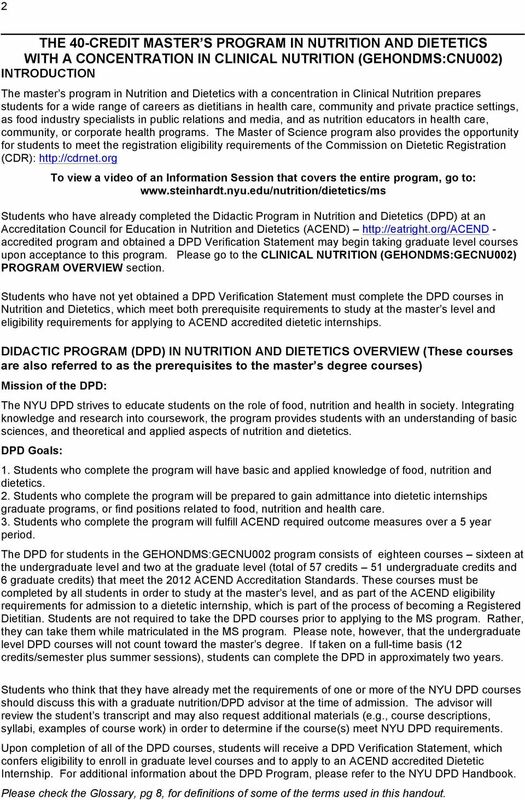 Students who have not yet obtained a DPD Verification Statement must complete the DPD courses in Nutrition and Dietetics, which meet both prerequisite requirements to study at the master s level and eligibility requirements for applying to ACEND accredited dietetic internships. DIDACTIC PROGRAM (DPD) IN NUTRITION AND DIETETICS OVERVIEW (These courses are also referred to as the prerequisites to the master s degree courses) Mission of the DPD: The NYU DPD strives to educate students on the role of food, nutrition and health in society. Integrating knowledge and research into coursework, the program provides students with an understanding of basic sciences, and theoretical and applied aspects of nutrition and dietetics. DPD Goals: 1. Students who complete the program will have basic and applied knowledge of food, nutrition and dietetics. 2. Students who complete the program will be prepared to gain admittance into dietetic internships graduate programs, or find positions related to food, nutrition and health care. 3. Students who complete the program will fulfill ACEND required outcome measures over a 5 year period. The DPD for students in the GEHONDMS:GECNU002 program consists of eighteen courses sixteen at the undergraduate level and two at the graduate level (total of 57 credits 51 undergraduate credits and 6 graduate credits) that meet the 2012 ACEND Accreditation Standards. 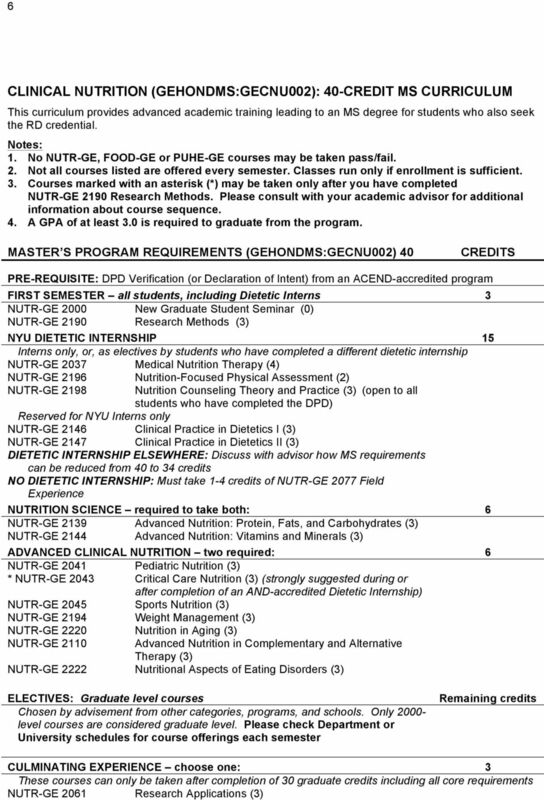 These courses must be completed by all students in order to study at the master s level, and as part of the ACEND eligibility requirements for admission to a dietetic internship, which is part of the process of becoming a Registered Dietitian. Students are not required to take the DPD courses prior to applying to the MS program. Rather, they can take them while matriculated in the MS program. Please note, however, that the undergraduate level DPD courses will not count toward the master s degree. If taken on a full-time basis (12 credits/semester plus summer sessions), students can complete the DPD in approximately two years. 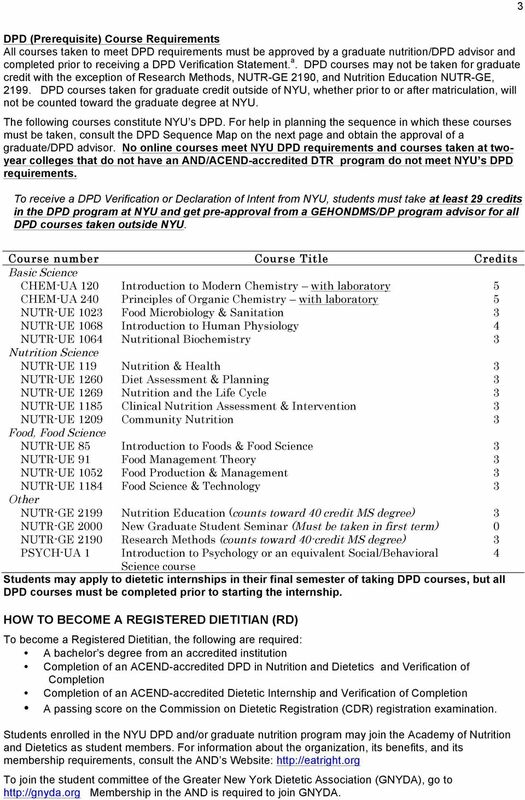 Students who think that they have already met the requirements of one or more of the NYU DPD courses should discuss this with a graduate nutrition/dpd advisor at the time of admission. The advisor will review the student s transcript and may also request additional materials (e.g., course descriptions, syllabi, examples of course work) in order to determine if the course(s) meet NYU DPD requirements. Upon completion of all of the DPD courses, students will receive a DPD Verification Statement, which confers eligibility to enroll in graduate level courses and to apply to an ACEND accredited Dietetic Internship. For additional information about the DPD Program, please refer to the NYU DPD Handbook. Please check the Glossary, pg 8, for definitions of some of the terms used in this handout. 3 3 DPD (Prerequisite) Course Requirements All courses taken to meet DPD requirements must be approved by a graduate nutrition/dpd advisor and completed prior to receiving a DPD Verification Statement. a. DPD courses may not be taken for graduate credit with the exception of Research Methods, NUTR-GE 2190, and Nutrition Education NUTR-GE, DPD courses taken for graduate credit outside of NYU, whether prior to or after matriculation, will not be counted toward the graduate degree at NYU. The following courses constitute NYU s DPD. For help in planning the sequence in which these courses must be taken, consult the DPD Sequence Map on the next page and obtain the approval of a graduate/dpd advisor. No online courses meet NYU DPD requirements and courses taken at twoyear colleges that do not have an AND/ACEND-accredited DTR program do not meet NYU s DPD requirements. To receive a DPD Verification or Declaration of Intent from NYU, students must take at least 29 credits in the DPD program at NYU and get pre-approval from a GEHONDMS/DP program advisor for all DPD courses taken outside NYU. Course number Course Title Credits Basic Science CHEM-UA 120 Introduction to Modern Chemistry with laboratory 5 CHEM-UA 240 Principles of Organic Chemistry with laboratory 5 NUTR-UE 1023 Food Microbiology & Sanitation 3 NUTR-UE 1068 Introduction to Human Physiology 4 NUTR-UE 1064 Nutritional Biochemistry 3 Nutrition Science NUTR-UE 119 Nutrition & Health 3 NUTR-UE 1260 Diet Assessment & Planning 3 NUTR-UE 1269 Nutrition and the Life Cycle 3 NUTR-UE 1185 Clinical Nutrition Assessment & Intervention 3 NUTR-UE 1209 Community Nutrition 3 Food, Food Science NUTR-UE 85 Introduction to Foods & Food Science 3 NUTR-UE 91 Food Management Theory 3 NUTR-UE 1052 Food Production & Management 3 NUTR-UE 1184 Food Science & Technology 3 Other NUTR-GE 2199 Nutrition Education (counts toward 40 credit MS degree) 3 NUTR-GE 2000 New Graduate Student Seminar (Must be taken in first term) 0 NUTR-GE 2190 Research Methods (counts toward 40-credit MS degree) 3 PSYCH-UA 1 Introduction to Psychology or an equivalent Social/Behavioral 4 Science course Students may apply to dietetic internships in their final semester of taking DPD courses, but all DPD courses must be completed prior to starting the internship. HOW TO BECOME A REGISTERED DIETITIAN (RD) To become a Registered Dietitian, the following are required: A bachelor s degree from an accredited institution Completion of an ACEND-accredited DPD in Nutrition and Dietetics and Verification of Completion Completion of an ACEND-accredited Dietetic Internship and Verification of Completion A passing score on the Commission on Dietetic Registration (CDR) registration examination. Students enrolled in the NYU DPD and/or graduate nutrition program may join the Academy of Nutrition and Dietetics as student members. For information about the organization, its benefits, and its membership requirements, consult the AND s Website: To join the student committee of the Greater New York Dietetic Association (GNYDA), go to Membership in the AND is required to join GNYDA. 5 5 *For Graduate Students only, an equivalent behavioral/social science course is also acceptable. ** Graduate student courses. Solid arrows indicate pre-requisites. Broken lines indicate courses that may be taken concurrently as co-requisites, but not out of sequence. Do not take courses that have pre-requisites until you have completed the pre-requisites. CLINICAL NUTRITION (GEHONDMS:GECNU002) PROGRAM OVERVIEW The Clinical Nutrition concentration is a 40-credit curriculum for students seeking eligibility to obtain the RD credential along with advanced academic work leading to the MS. degree. It also provides the courses for the Dietetic Internship/Master s Program conducted jointly with the James J. Peters Veterans Affairs Medical Center (JJPVAMC). 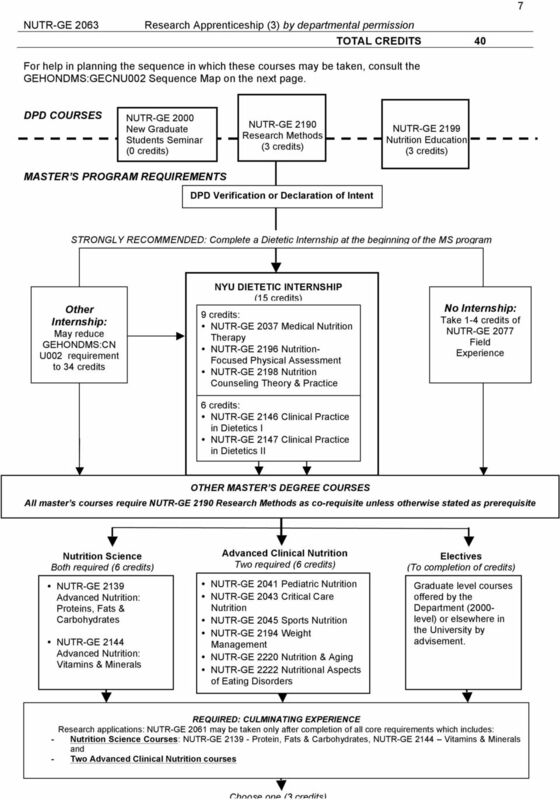 Admission to dietetic internships is competitive, accomplished through a national computer matching system, and requires separate applications to the Internship and the computer matching system. For detailed information on the NYU Dietetic Internship, please go to: For information about the James J. Peters Veterans Affairs Medical Center Dietetic Internship/NYU MS Program in Clinical Nutrition, please go to: PROGRAM GOALS The goals of the Clinical Nutrition concentration within the MS program in Nutrition and Dietetics are to provide students with the knowledge and skills to: 1. Educate individuals and the public on food choices that will optimize health and prevent disease. 2. Apply nutrition principles and diet assessment to the treatment of diet-related disease conditions. 3. Manage human, financial, and physical resources to improve the nutritional care of individuals and population groups. 4. Help improve the nutritional status of individuals and population groups. 5. Monitor trends and issues in the discipline of nutrition, and translate this information into curriculum, education, and training programs. 6. Apply research principles and methods to the examination of current problems in nutrition and health. 8 8 CAREER OPPORTUNITIES Clinical dietitians or managers of nutrition programs in hospitals, clinics, long term care facilities, and other health care settings. Members of clinical specialty teams in pediatrics, internal medicine, family medicine, infectious disease surgery, renal, gastrointestinal, cardiovascular, and critical care medicine services. Counselors of patients with chronic conditions such as diabetes, cardiovascular disease, obesity, and hypertension. Community nutritionists in a wide variety of programs sponsored by local, state, and federal agencies of the government and private sector. Nutrition educators in health care, community, or corporate health programs. Private nutrition consultants to the general public, health care agencies, weight management programs, government agencies, and the food industry. Staff members of private sector health agencies such as the American Heart Association, the Red Cross, or the March of Dimes. Staff members of local and state health departments. Staff members of federal agencies such as USDA, Library of Congress, National Institutes of Health, and the Food and Drug Administration. Nutrition teachers in schools, colleges, and universities. Project officers of private philanthropic foundations. Profit and non-profit positions that focus on nutrition education, media and communications of food, nutrition and health. GLOSSARY AND - Academy of Nutrition and Dietetics approximately 70,000-member organization of food and nutrition professionals. ACEND - Accreditation Council for Education in Nutrition and Dietetics AND s accrediting agency for education programs that prepare students for careers as registered dietitians (RD) or dietetic technicians, registered (DTR). ACEND is recognized by the United States Department of Education. CDR Commission on Dietetic Registration AND s agency for the credentialing of registered dietitians, dietetic technicians registered, and board certified specialists in 5 practice areas of nutrition and dietetics. DI - Dietetic Internship ACEND accredited program that provides a minimum of 1200 hours of supervised practice in dietetics. Successful completion of a dietetic internship allows students to meet CDR eligibility requirements to take the registration examination for dietitians, thus becoming RDs. Dietetic Internship Verification Process whereby a dietetic internship director verifies completion of a dietetic internship. DPD - Didactic Program in Nutrition and Dietetics ACEND accredited program that provides students the foundation knowledge required for dietetics practice. Students who complete the courses in a DPD program and are verified by their DPD Director are eligible to apply to an ACEND accredited dietetic internships. 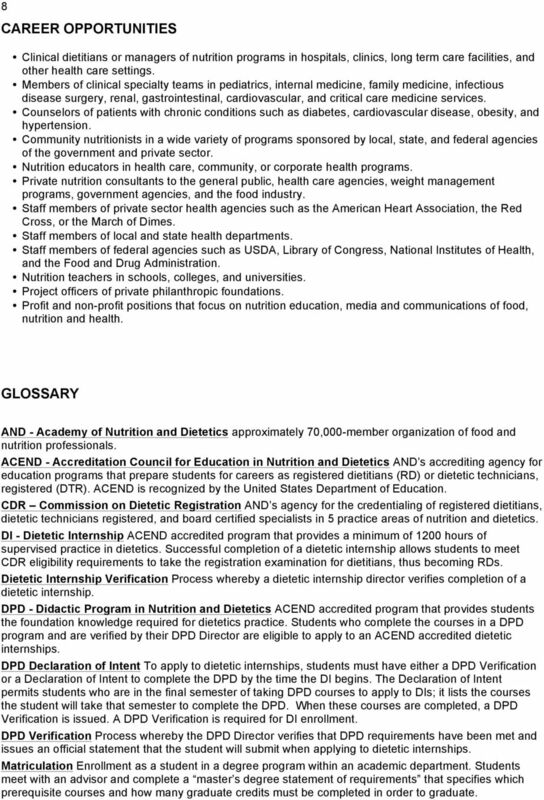 DPD Declaration of Intent To apply to dietetic internships, students must have either a DPD Verification or a Declaration of Intent to complete the DPD by the time the DI begins. The Declaration of Intent permits students who are in the final semester of taking DPD courses to apply to DIs; it lists the courses the student will take that semester to complete the DPD. When these courses are completed, a DPD Verification is issued. A DPD Verification is required for DI enrollment. DPD Verification Process whereby the DPD Director verifies that DPD requirements have been met and issues an official statement that the student will submit when applying to dietetic internships. 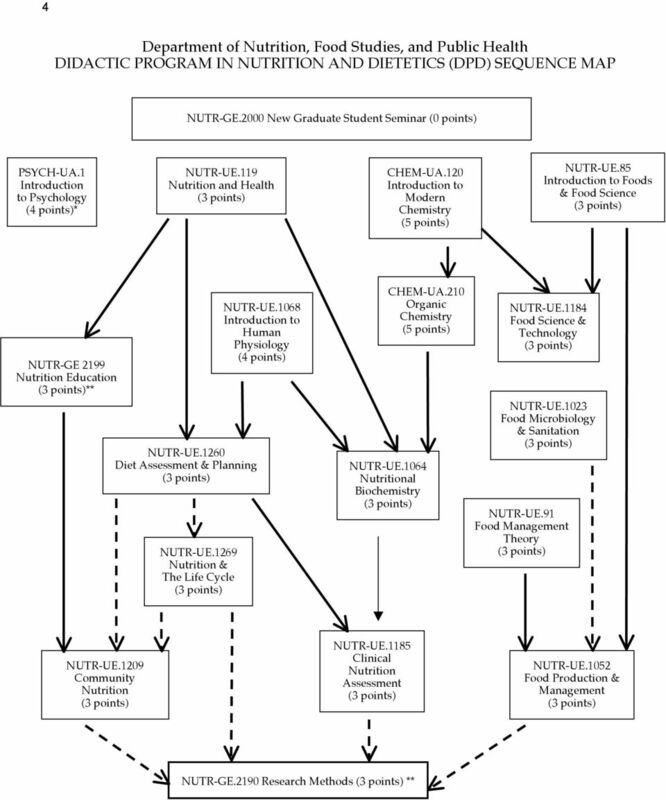 Matriculation Enrollment as a student in a degree program within an academic department. Students meet with an advisor and complete a master s degree statement of requirements that specifies which prerequisite courses and how many graduate credits must be completed in order to graduate. 9 9 OTHER PROGRAM OPTIONS The Department offers additional master s degree options to students who already hold the Registered Dietitian (RD) credential or another health care credential. These include: Clinical Nutrition (GEHONDMS:GECNU002) 34 credit option for Registered Dietitians or anyone who has completed a ACEND-accredited dietetic internship: Foods and Nutrition (GEHONDMS:GEFNU001) 34 credit option available only for holders of health care credentials (e.g., RD, RN, MD, DDS, RPh) who would like to learn more about nutrition but are not interested in becoming dietetics practitioners: ADMISSIONS Applicants must have a bachelor's degree from an accredited institution. 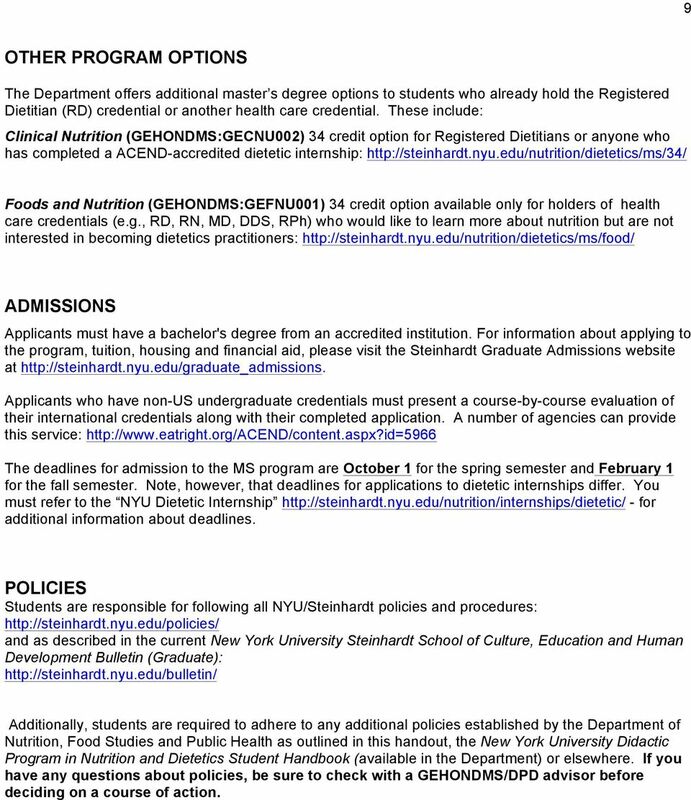 For information about applying to the program, tuition, housing and financial aid, please visit the Steinhardt Graduate Admissions website at Applicants who have non-us undergraduate credentials must present a course-by-course evaluation of their international credentials along with their completed application. A number of agencies can provide this service: The deadlines for admission to the MS program are October 1 for the spring semester and February 1 for the fall semester. Note, however, that deadlines for applications to dietetic internships differ. 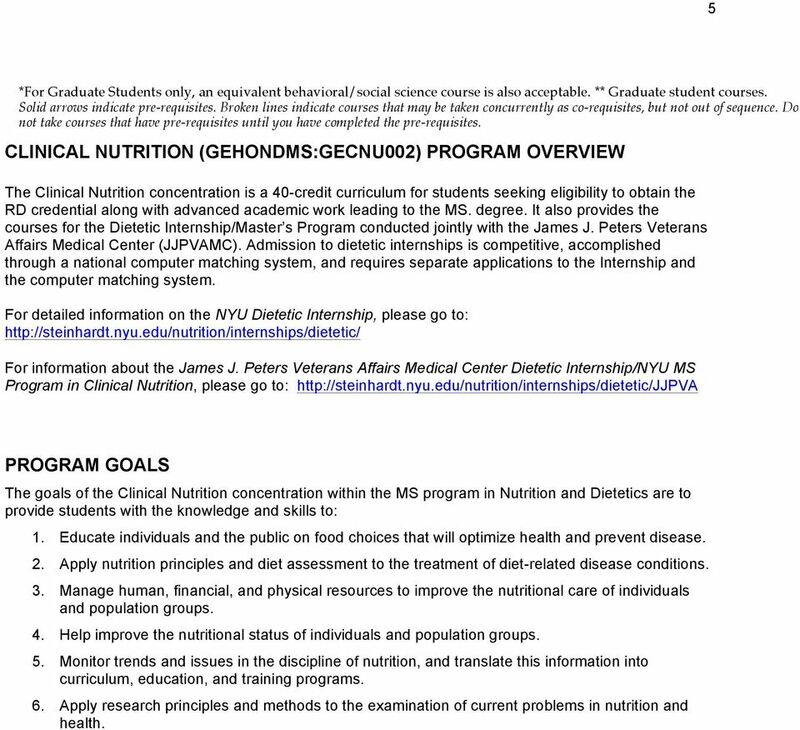 You must refer to the NYU Dietetic Internship - for additional information about deadlines. POLICIES Students are responsible for following all NYU/Steinhardt policies and procedures: and as described in the current New York University Steinhardt School of Culture, Education and Human Development Bulletin (Graduate): Additionally, students are required to adhere to any additional policies established by the Department of Nutrition, Food Studies and Public Health as outlined in this handout, the New York University Didactic Program in Nutrition and Dietetics Student Handbook (available in the Department) or elsewhere. If you have any questions about policies, be sure to check with a GEHONDMS/DPD advisor before deciding on a course of action. Dietetics Professionals Who are they? Where do you find them? What do they do? Careers in Dietetics: The Sky Is the Limit http://www.youtube.com/watch?v=rp9k6uulhgg&feature=channel _page Who are dietitians? Preparation "Dietitian and Nutritionist Overview"
Public Health Nutrition Major M.P.H. Department of Family & Consumer Sciences Didactic Program in Nutrition and Dietetics (DPND) Handbook 2013 Updated March 15, 2013 The University of Wyoming is an equal opportunity/affirmative action institution. When does the MPAS program start? Master of Physician Assistant Studies Program Frequently Asked Questions A new MPAS cohort begins in Graduate Term II. This is typically the week before or after Thanksgiving. The first transition point in teacher education programs is admission to teacher education. Criteria are noted below. The program consists of a minimum of 36 credit hours of course work, which includes a required six credit hour project or thesis.